A chatbot in the simplest of words can be explained as 'something' that is offering an opportunity to brands to engage with consumers directly on a personal level. And, that 'something' is from the world of AI (Artificial Intelligence). So, when we are interacting with a brand, the representative from the brand's side answering us is not a human but a chatbot. Training a bot is not so easy and brands are taking time and effort to invest in this technology. 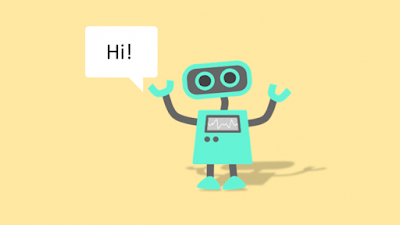 Today, hundreds of brands have ventured into chatbots from various industries like food & alcohol, banking & finance, travel, entertainment, beauty &clothing, news & media, sports, social sector and health & fitness. I checked out many bots, read about few like CNN, NBC, The New York Times, Wall Street Journal, Taco Bell, Pizza Hut, Domino's, Whole Foods, Burger King, Burberry, Nordstorm, Armani, Nike, NBA, KLM, Ebay, Hotels.com, Unicef and the list goes on. Starbucks - Chatbot is inside the app which takes orders via voice ore text, tells you the time when the order will be ready and price of your order. It was launched in Jan this year. See how it works. Sephora - It is on KiK (messenger app) which offers personal assistant for products reviews, makeup tutorials and in-shop buying assistance too. It is one of the smartest chatbots around. Watch for yourself. Also, they have launched couple of more bots this year to suit your requirement. I just loved how popular it has become over here in the US. Lyft - FB Messenger based chatbot which allows you to request a ride via your chat. In return, if the request is accepted, current location of the driver, car model and number plate's picture will be shared with you. Is it something different than the app, probably no, but it is just adding one more way to market itself and become accessible. 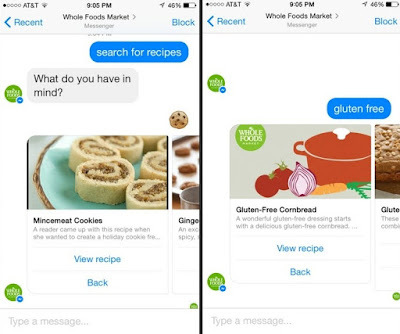 Whole Foods - What I really liked about this chatbot was the simplicity yet a very new and cute way to interact. Simple because it only provides you the recipes and cute because you can put an emoji of the food and text your dietery restrictions and available choices at home. Hotels.com - No, no, this is not just your regular service industry chatbot but a personal assistant who will challenge you to play a game and every win will be rewarded with a discount coupon or a hotel voucher. It is an FB messenger based bot and I found the concept really innovative. Extra brownie points for this one, do you agree with me? Diageo - It offers a personal bartender which caters to all your home bar-tending needs (recipes of cocktails) with the available ingredients. It is FB messenger based app. The Wall Street Journal - Again an FB messenger based app that provides you with top big news, analyses stock quotes, customizes the alerts at your given time, compare the quotes for you. Pizza Hut - It is FB messenger based app that takes the order, reorder basis your previous orders and provides you with current deals. Domino's also provides with all the above details and also provides the status of your order. HM - They are big on social media and also very popular with their KiK based bot. It provides you with personal stylist, helps you with outfits, shares with you current styles and inspirations for the outfits. The other bots that I liked were Master Card, Harper Collins and Macy's. They came very early but have not innovated much in their offering. In the above examples that I have listed, I have focused on innovation or creativity or popularity. I would like to repeat that it is not easy to train a bot because after a while queries become complicated. By bringing newness, fun and engagement in the chatbot, brands are investing a lot of time, money and resources in AI. I also read a beautiful statement which clearly defines and sums-up the need of chatbots in today's world - "We are living in the ‘expectation economy’ where consumers expect to have information at their fingertips, and we want to keep innovating to meet our customers where they are" Jeff Jenkins, global executive of digital strategy and marketing at Whole Foods Market. I would love to hear your thoughts or suggestions! I am a social media consultant with an experience of working with many international brands and agencies. I can help you grow your brand with social media strategies, campaign formulation and execution, content management and as I say, Everything Digital! 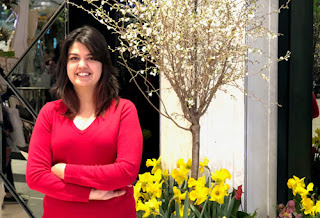 I love life and I document everything that life has to offer on my blog, be it travel, food, books, fragrance, movies and more. I also passionately write about digital marketing and brands. To know more, follow me on social channels.